Is your payroll data dirty? Payroll data must be absolutely accurate. Find out how the Payroll Audit System can help you "scrub" your database and reduce your correction payroll runs by as much as 80%!. If your company is a payroll service bureau, then technology IS your business! Payroll providers (service bureaus) have specialized technology requirements which tend to make things complicated. We are here to help! How much time and labor dollars do I waste by not automating repetitive tasks? If I could reduce or eliminate correction payrolls for mistakes, how much would that improve my business flow? We specialize in the payroll industry, especially with companies that utilize the Millennium 3™ payroll software (developed by MPay Software). Audit the data in your payroll database and payrolls BEFORE they are processed. Reduce your correction payroll runs by up to 80%! The Payroll Audit System assists the payroll service bureau in "scrubbing" your payroll data before and after payroll processing. This helps reduce the need for correction payroll runs, tax problems and a variety of other issues. The system consists of two main parts: Scheduled Audits and Pre-Process Audits. 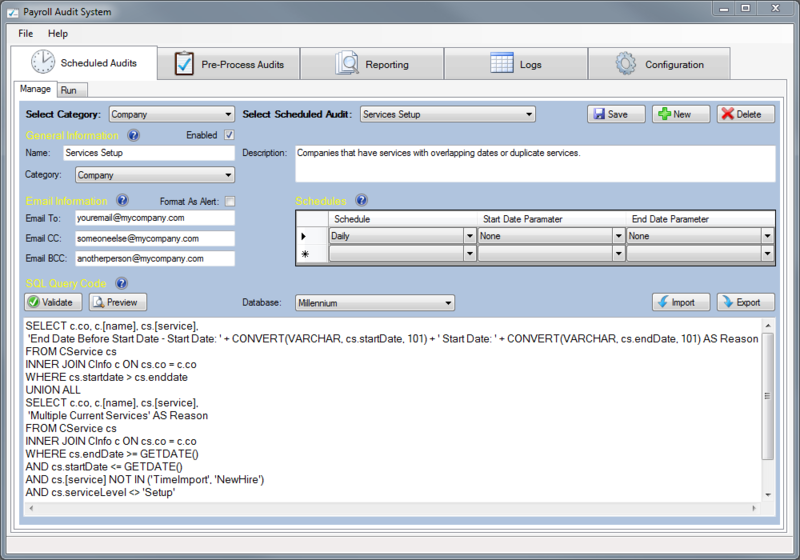 The majority of the Audit System management is accessed via a separate management console. Add/edit/remove audits. View reports on audit status, who is getting which audits and when, etc. Archive/purge log data. The Scheduled Audits are SQL queries that are run against the payroll database and the results emailed to specified recipients on a customizable schedule. These audits are completely customizable to allow for an infinite amount of possibilities. (Example: List companies with an incorrect tax setup.) Run audits daily, weekly, monthly, quarterly, yearly or even all throughout the business day. Any of the audits in the system can also be run manually (ad-hoc). 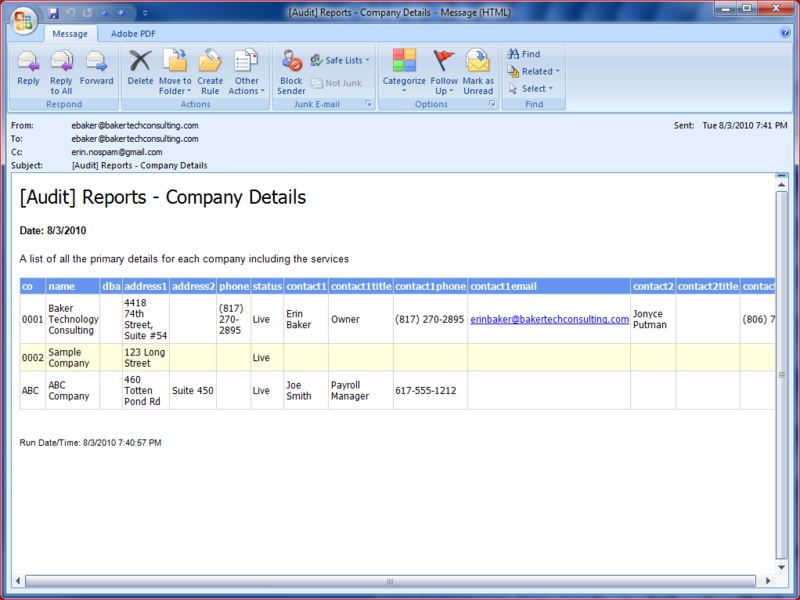 The audits generate HTML tabular formatted emails to desired recipients and are easy to read and appealing to the eye. Audits may be set to be formatted as "alerts", using bold and noticeable colors. The system comes preconfigured with approximately 100 different audits, ranging from invalid employee birthdates to missing taxes on W2 employees. These reports can help fulfill SAS70 audit requirements. 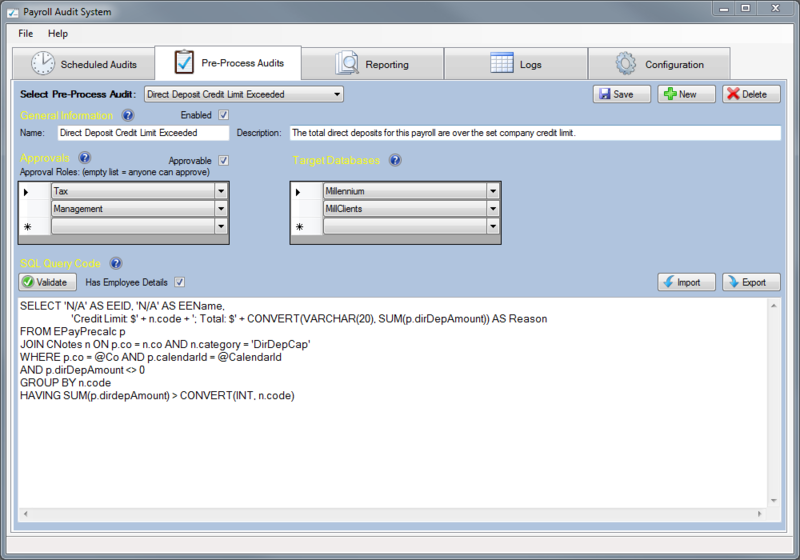 All of the audits performed by the Audit System are written in standard T-SQL code. Therefore, changes to audit parameters are easily made. 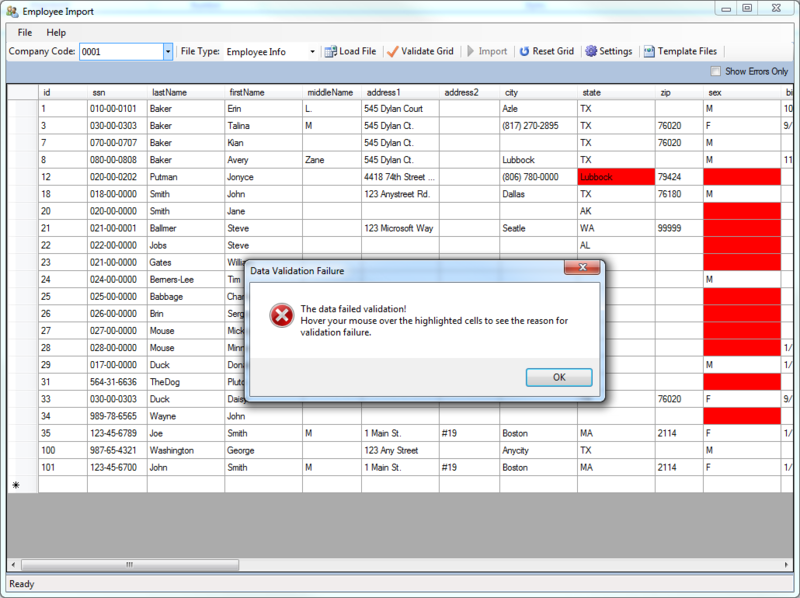 For those experienced in SQL, fully custom audits can be written to analyze data in any of the payroll database tables. The Pre-Process Audit portion of the system provides a customized “Payroll Submit” screen in the payroll system which executes special SQL queries against the payroll. When users local to the service bureau (CSR's, Citrix users, etc.) 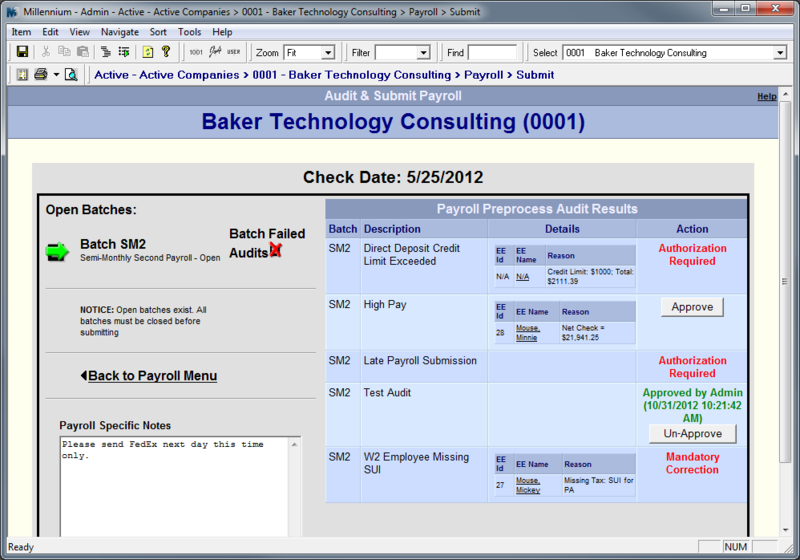 enter the submit screen, the system automatically audits the payroll based on parameters that you define. (Example: W2 employees missing taxes, paycheck is over a certain amount threshold.) Preprocess audits can be configured to be mandatory or approvable. For mandatory audits, the item must be corrected before they are allowed to submit the payroll. For approvable audits they are given an “Approve” button which logs the user and time that they have approved it. Approvable audits can be assigned roles from the payroll system to allow only users in those roles to approve those audits. For remote clients, you can run the audits on the payroll before it is processed by using the customized Job Requests screen. If any audits fail, the payroll can be opened, corrected and re-submitted. This process will greatly reduce your correction payroll runs and tax department issues at quarter and year end. The Employee Import Utility allows you to import new employees, update existing employees and import/update employee information in the payroll database from customizable, preconfigured Excel template files. Virtually any employee data can be imported/updated, from demographics to taxes to HR tables. Multiple levels of validation occur before an import can take place. (Example: When importing deductions, earnings and taxes the utility verifies that the items exist on the company level before allowing the import to proceed.) This helps prevent "bad" data from being imported into the payroll system. The utility can also be used for quick manual batch entry of employee data instead of using the new hire screen in the payroll system. The Company Import Utility allows you to convert a new company, import new or updateexisting company information in the payroll database from customizable, preconfigured Excel template files. Multiple levels of data validation occur before the import can take place. (Example: When importing deductions, the utility verifies that dependent items, such as the agencies or calc codes, exist on the company before allowing the import to proceed.) This helps prevent "bad" data from being imported into the payroll system. The utility can also be used for quick manual batch entry of company data instead of using the screens in the payroll system. The Efficient Forms™ to Millennium 3™ Interface imports new employees from XML files delivered through Efficient Form’s™ EFConnect service. EFConnect is a Windows Service application that can be obtained from Efficient Forms™. d TurboTax™ W2 Import - Intuit pays you!! When your company participates, you will offer a benefit that over one million employers offer their employees: the ability to automatically import their W2 into the tax filing process using TurboTax™. You will also be offering an ancillary service that competes with large payroll providers such as ADP™, which have been offering the TurboTax™ W2 import program for years. Income earned for each successful W2 import – TurboTax™ pays you! The W2 Export utility allows you to export all W2s for a selected company and specified tax year to a designated folder on your computer or network. The IRS Filing Status Utility allows you to compare the filing status download file provided by the IRS to the status in the Millennium™ database. A report is produced showing any discrepancies. 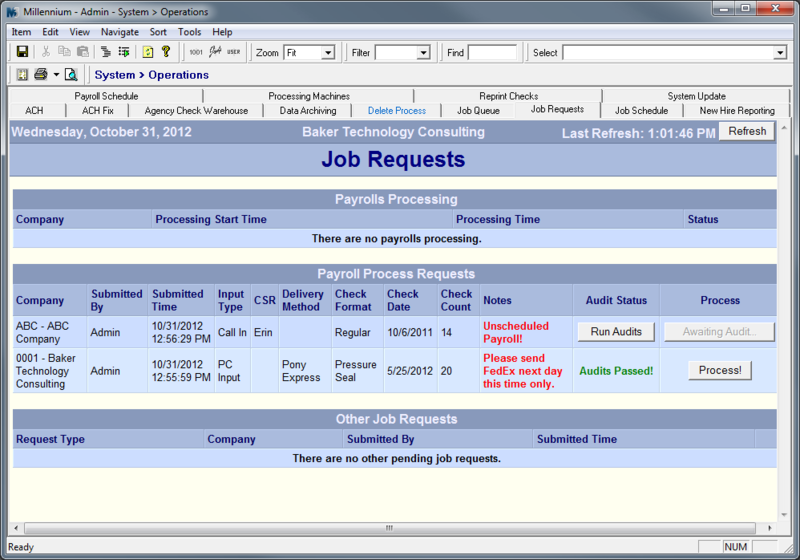 The Interactive Payroll Schedule Screen replaces the default payroll schedule screen in Millennium 3™. No more printing schedule reports! 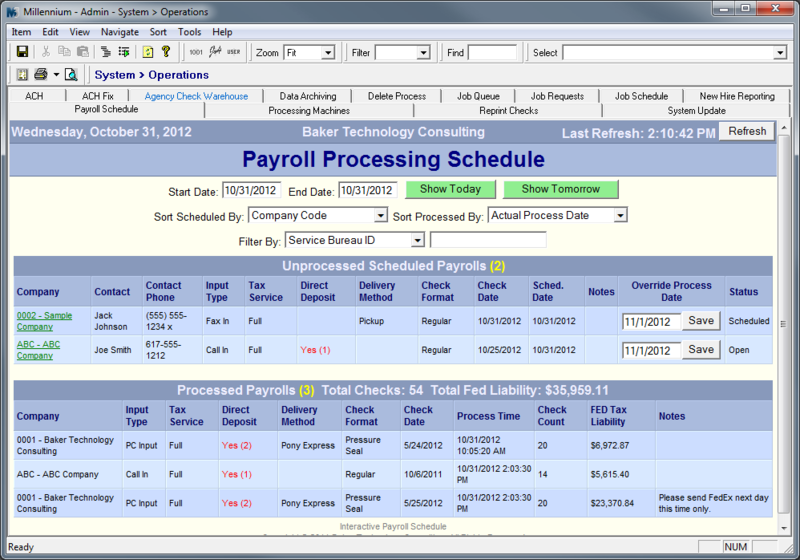 The screen shows unprocessed and processed payrolls for the given date range. Numerous sort and filter options make it easy to customize the view, per user. Easily and quickly see who has processed and who hasn't. Update payroll notes, change the scheduled process date, mark a payroll as "received", all in one place! The Company Dashboard Screen replaces the default company and company maintenance screens in Millennium 3™. The screen provides quick access to the most accessed data for a company. Need to know if the company is on direct deposit and how many employees use it? Done! Want to see active employee count, active company services, current check date and payroll status all in one place? Bingo! 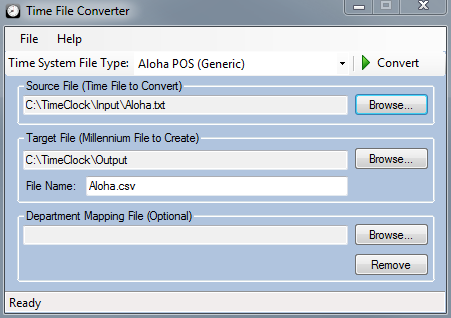 The MAG File Analyzer compares the contents of MAG (Magnetic Media) files generated from the payroll system to what the payroll database actually contains. It looks for discrepancies in totals reported on the file as well as the companies expected to exist on the file. Currently the analyzer will process the following MAG file types: W2, Oklahoma SUI, Kansas SUI, New Mexico SUI, Tennessee SUI and Texas SUI. This is useful if your service bureau is verifying Social Security numbers for your clients. Dump your SSA file to a folder and have an automated script parse it and send out emails to your clients. No more manual effort! It reads the SSA return file and generates a customizable email from the payroll database to notify your clients of possible SSN errors for their employees. When a secondary payroll is processed that reaches the 100K liability and is created with the incorrect due date, simply put the tax deposits on hold, open the Tax Checks utility and change the due dates to modify amounts on the tax deposit. Also, allows for modifying amounts on agency checks. This utility will allow you to pull in an existing calendar date and change it to a new date without deleting and adding new calendar dates in payroll. The helps prevent unscheduled payrolls. It also allows you to modify pay period dates on the associated batches at the same time. We have an extensive library of pre-built reports but can also create new reports based on your specifications. Do you have a client that is coming from another provider but want to keep their reports? Let us duplicate the report for your payroll system! We can produce a custom program for you to interact with the payroll database or one that is completely stand-alone. All Millennium™-based programs utilize the M3 COM object and are written using the latest Microsoft .NET Framework. Many of the screens in Millennium™ can be customized or completely replaced to suit your needs. 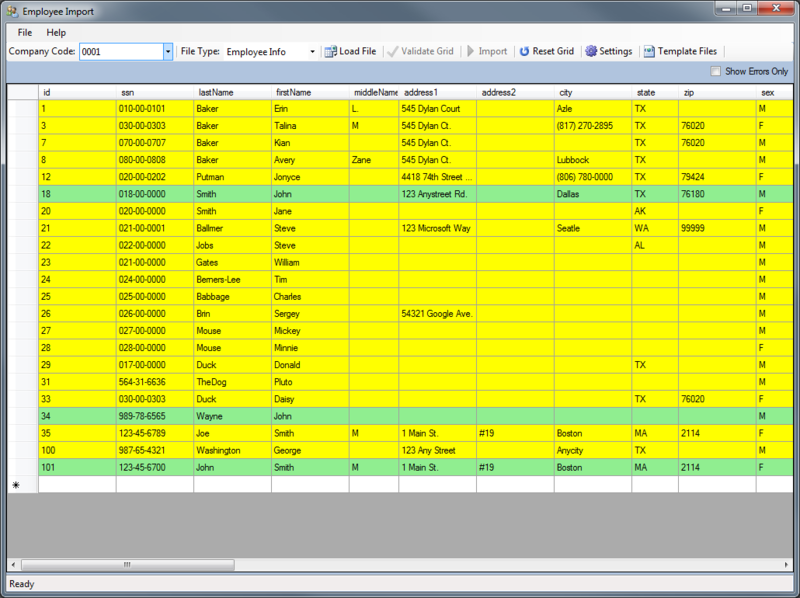 (Examples: Payroll Schedule, Job Requests, Company Menu, Employee Menu, Employee Information, etc.) We can help make your payroll system truly yours. The payroll database by nature requires constant maintenance and tuning specific to your company's needs. It must also be kept safe and secure. We have many years of experience in maintaining SQL databases. Coupled with years of Millennium 3™ experience, we can help you to make your database perform according to your specifc usage. From simple backups to index reorganization and creation, we can help in any capacity. Contact us for a FREE evaluation of your system. In today’s society with mounting cyber security threats, internal controls and process audits are a must. Our knowledge with public accounting and information technology, combined with a background in payroll processing, will help us provide your service bureau with customized, solid internal controls and audits. These controls and processes will also help your operations run efficiently and effectively, preventing costly and time consuming mistakes. We have a library of pre-built accounting software interface reports for Millennium™ or we can also create custom file export reports to interface with virtually any accounting software package. Erin Baker is the face behind the name of Baker Technology Consulting. He has been in the IT field since 1999 and has been a computer-phile since the age of 12. He started out selling computers at Best Buy but decided he'd rather fix them than sell them. So he made the jump from sales to repair and installation. This began his career in Information Technology. Shortly thereafter, in 1999, Erin landed a job as systems administrator at Occidental Petroleum, a global oil, gas and petrochemicals company. While with the oil company, he oversaw thousands of computers, helped manage a network that spanned several continents and was exposed to the very latest in enterprise technology. He was also chief architect for the company's global Citrix farm and oil field automation systems. From 2004 to 2017, Erin was employed at Fastpay Payroll as their "jack-of-all-trades" systems administrator. At Fastpay he has learned much about the payroll provider industry and how complex the technology requirements can be. His time at Fastpay has also made him very familiar with the inner workings of the payroll software Millennium 3™, developed by MPAY Software. 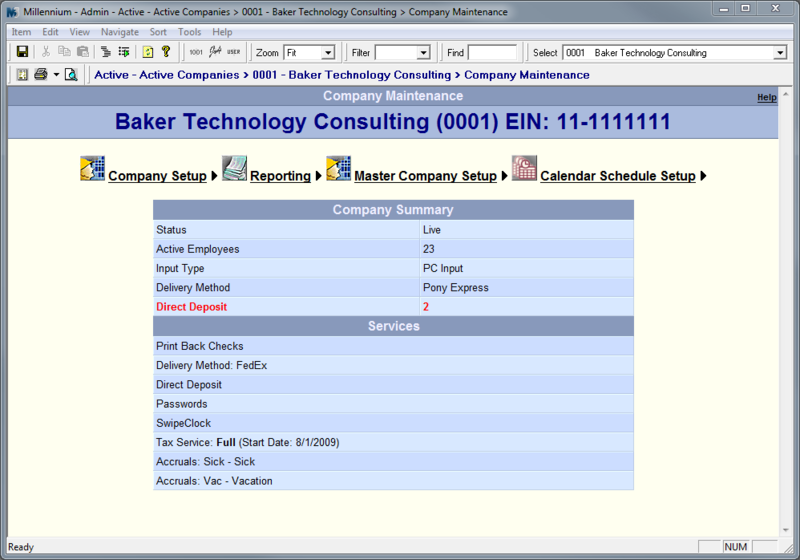 Baker Technology Consulting, LLC. © 2007-2018. All Rights Reserved. All trademarks, trade names, or logos mentioned or used on this website are the property of their respective owners.